Family reunion season is in the summer, which means now is a good time to think about details such as any mementos or souvenirs you’d like to create, whether to remember the reunion or for attendees to take home. A family tree thumbprint poster for each person to add his or her unique mark. You would need the blank tree, colored ink pads, and baby wipes so people can wipe off the ink. A printable blank tree is part of our Instant Family Reunion Deluxe Kit in Family Tree Shop (it also includes a planning checklist and book; coordinated templates for pretty name tags, signs and other materials, a decorative family tree you can type in and print copies, and more). A family cookbook, consisting of recipes handed down and relatives’ new favorites. You could have contributors send recipes ahead of time and paste them into a Word document to print and share, or have people bring recipe cards you can collect, copy and share. Or go fancier and create a cookbook on a photo book website. Most sites let you share your photo project so others can order copies for themselves. A quilt made of squares contributed by each person or family. You would need fabric markers or paint and cloth squares, and a handy person to sew them all together later on. You could auction off the quilt to raise money for next year’s reunion (and then the winner could bring it back to be auctioned again for another relative to keep for the year). If you want families to be able to take something home, you could have them create two squares, one for the quilt and one to keep and frame. A scrapbook, with pages created by each family (ask attendees to bring their family photos). You can scan the pages later to share. An autograph album, with the signature of each reunion attendee. An ongoing album with photos from each reunion, which a designated person could keep, update with new photos, and bring back each year. 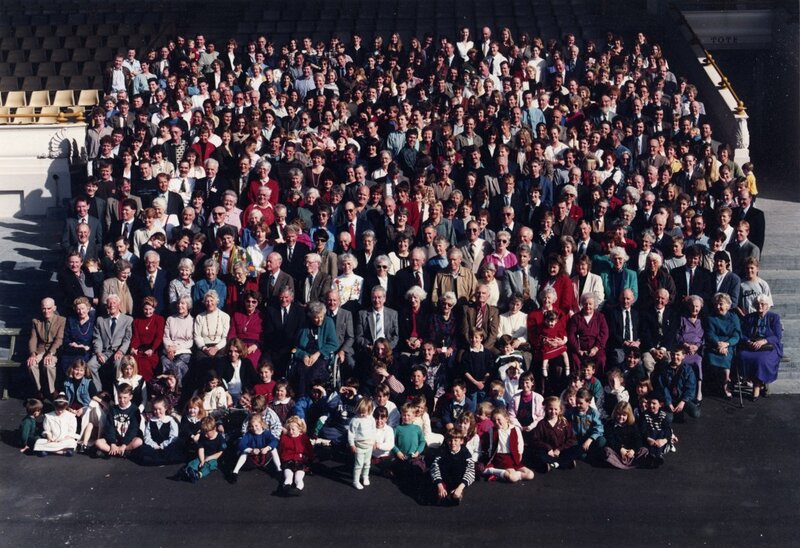 A large group photo, like this one or even this one. You can have reprints made for each person, or email digital copies (if a professional photographer takes the shot, be sure to get his or her permission first). Have the children interview their grandparents and record it, or have someone write down the questions and answers on an interview form (part of the aforementioned Instant Family Reunion Deluxe Kit). You can create a video or compile the forms into a book to share. T-shirts with your family name and an old photo or a group shot from a previous reunion. It might be fun to have fabric paint or markers so people can personalize their shirts. A family calendar with birthdays and anniversaries marked, and perhaps important dates in family history. You can download calendar templates from the internet at sites such as this one or use the ones available with your word processing software. Plants from Grandma’s garden. You could root cuttings ahead of time, then distribute them in small flower pots. What reunion goodies has your family created? Click Comments below to tell us. The Instant Family Reunion Deluxe kit is on sale in April in Family Tree Shop. Check it out today—fewer than 50 are left. This entry was posted in Family Reunions, Genealogy Insider, Now What, Save and Share Family History. Bookmark the permalink. We put together a family history book which includes the family tree, old photos, family stories, new births, marriages, deaths since the last reunion. We also put together a cookbook and a family directory. T-shirts, photo-shoots, the whole nine yards! I made up keychains for my husband’s family reunion using the picture of his grandparents. Also I made up magnets, and printed a picture on hats. I made up a calendar with birthdays color-coded for each of the original 12 children’s families. I made a family tree chart with pictures of everyone and set it up on an easel. Everyone really enjoyed that. Every year I investigate for something differEnt. It’s so much fun.